Cute, colorful, and carefree! 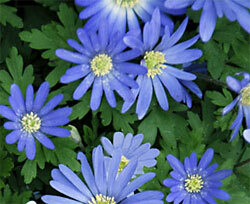 Also known as Grecian windflowers, Anemone Blanda Blue Shades produces light blue, daisy-like flowers with pale yellow centers on 3-4 inch stems. Plants bloom at mid spring and are excellent for layering under and around daffodils and tulips in mixed bulb beds. Easy to grow in planters and pots. Very hardy, the bulbs will naturalize readily and bloom year after year. Planted in larger drifts they form a spectacular spring ground cover. Up to 6 inches tall.